Vin Diesel reprises his role as the antihero Riddick in the latest chapter of the groundbreaking saga. A dangerous, escaped convict wanted by every bounty hunter in the known galaxy, Riddick has been left for dead on a sun-scorched planet that appears to be lifeless. Soon, however, he finds himself fighting for survival against alien predators more lethal than any human he's encountered. The only way off is for him to activate an emergency beacon and alert mercenaries who rapidly descend to the planet in search of their bounty. With time running out and a deadly storm on the horizon that no one could survive, his hunters won't leave the planet without Riddick's head as their trophy. Also starring Katee Sackhoff, Karl Urban and Dave Bautista. $19.030 million on 3117 screens. Back in the early 2000s, Vin Diesel starred in two movies that spawned franchises. 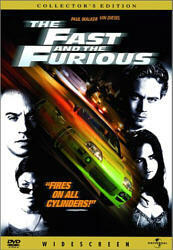 To date, 2001’s The Fast and the Furious had produced six films, with a seventh in production and huge box office returns for each one. Indeed, 2013’s Fast and Furious 6 made almost $800 million worldwide and guaranteed more sequels for years to come. On the other hand, Diesel’s “Riddick” series hasn’t fared nearly as well. It started with 2000’s Pitch Black and continued through 2004’s Chronicles of Riddick and 2013’s Riddick. The sequels outgrossed the $39 million US take of Pitch Black, but not by much, as Chronicles made $57 million and Riddick earned $42 million. Overseas sales didn’t add a tremendous amount to the pot, either; with $115 million total, Chronicles was the biggest “hit” of the bunch. Because it appears unlikely the $105 million Chronicles ever turned a profit, the existence of Riddick becomes a surprise. Perhaps Diesel enjoys the character and used his Fast and Furious-based leverage to force the studio’s hand. I suppose it helps that the 2013 film actually made money; while it only grossed $98 million worldwide, its meager $38 million budget allowed it to enter the (pitch) black. So will we get more Riddick films in the future? Perhaps, though it seems like a tough sell, as I’m not sure there’ll be a ton of demand. In Riddick, we re-encounter our lead anti-hero (Diesel). At the end of the last movie, he’d become Lord Marshal of a clan called Necromongers, but uneasy lies the head that wears a crown and all that. Riddick encounters threats all around him and eventually agrees to turn over his role to Commander Vaako (Karl Urban) if they return him to his home planet of Furya. However, Riddick finds himself betrayed and left for dead on a hostile alien world where he must battle to survive. We follow Riddick’s path as he attempts to stay alive and find his way out of this threatening realm – and past the bounty hunters who come to find him. Even though I saw Chronicles, I felt as if I went into Riddick blind. I remember so little about the 2004 film that I may as well never have seen it, and the 2013 flick does little to bring viewers up to snuff. It starts on the alien planet and shows Riddick’s interactions with the Necromongers as a flashback. 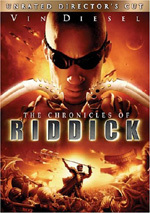 At no point does it do much to educate new viewers about who Riddick is or what brought him to the Necromongers; you need to read plot synopses to understand those elements. When I watched Chronicles in 2004, I felt similarly left out in the cold, as it didn’t bother to educate those who’d not seen Pitch Black, so I guess it’s not a surprise that Riddick also avoids similar exposition. I’m not terribly sure any of it matters anyway, as the story probably wouldn’t work any better with that extra detail, but it might help ground the viewer; matters can get fairly confusing in the first act. In the same vein, I would’ve preferred a more chronological telling. Sometimes movies open with action and flash back for exposition to avoid “slow starts”, but I don’t think that would’ve been an issue here. If Riddick had opened with the lead as Lord Marshal and showed his betrayal, it might’ve lacked some of the alien planet’s visceral nature, but it also would’ve allowed us to better understand what the heck was at play. As depicted, we’re fairly confused for the flick’s opening 20 minutes or so, and that’s unnecessary confusion; the filmmakers easily could’ve made the tale clearer without any sacrifice of entertainment. Ultimately, little of that material matters anyway. I suspect the Necromonger scenes exist solely to explain to viewers of the prior films how Riddick ended up on the alien planet; otherwise they feel utterly superfluous and could’ve been dealt with in a quicker/more efficient manner. In essence, Riddick is two movies. The first third gives us a kind of Cast Away in which Riddick survives on his own, and then once the bounty hunters arrive, it becomes a mix of The Most Dangerous Game and Home Alone before it turns into Aliens. Honestly, the bounty hunter section feels like a different film; it introduces new characters and minimizes Riddick to a substantial degree. This becomes jarring after that first third. We spend so much time with Riddick that it seems strange to lose track of him for so long and spend so much time with these previously-unknown characters. That said, Riddick does become more interesting once the bounty hunters enter. As noted, I don’t have much use for the Necromonger material – it really does seem gratuitous – and though some of the “survival” material works, those scenes go on for too long; the film could’ve cut short Riddick’s Cast Away sequences and not lost anything. All of this footage feels like foreplay, though it’s frustrating foreplay because we don’t know where the movie plans to go. Sure, we expect action at some point – more action than just Riddick vs. alien beasties, at least – but we get no sense of how these sequences will develop. The introduction of the bounty hunters does make narrative sense, but it also feels like it comes out of nowhere and adds to the jarring nature of the movie’s shift. Still, after all those “Riddick the lone wolf” sequences, it’s nice to see the narrative move along, and the bounty hunters add life to the film – even if they provide uniformly cliché personalities. At least they facilitate a more active plot and motivate events in a lively manner. If Riddick ended up going anywhere especially interesting, that is. As it progressed, I waited for the high-octane thrills and action I figured it’d deliver, but they never came. Oh, we do move toward a climax, so it’s not like nothing ever happens. Unfortunately, the events that do transpire feel lackluster at best. The movie constantly hints at dynamic sequences but never manages to deliver them. Instead, it provides one sequence after another that seems to be headed in the right direction but never quite gets there. It doesn’t help that Riddick feels like an amalgam of other films – and other films that’re usually significantly superior to this one. At times the flick comes across like a melange of influences and little more; these fail to coalesce into anything memorable. I wouldn’t call Riddick a total loss. As was the case with Chronicles, it looks good, and it boasts surprisingly effective visual effects for a relatively inexpensive effort. It just doesn’t manage to give us characters and narrative that feel better than perfunctory. Riddick comes with the bones to create an exciting action movie but it ends up as a slow, semi-pointless affair with few thrills on display. Riddick appears in an aspect ratio of approximately 2.40:1 on this Blu-ray Disc. Across the board, the movie looked great. At all times, the image displayed terrific sharpness. Virtually no instances of softness marred the presentation, as it seemed consistently accurate and well-defined. The movie lacked shimmering or jaggies, and it also failed to suffer from edge haloes. Print flaws never marred the clean presentation. In terms of colors, expect a lot of yellows, as those dominated the alien environment. Blues cropped up at times – particularly in the Necromonger universe – and some oranges/reds appeared as well, but yellow carried the day. Within stylistic parameters, the hues seemed well-rendered. Blacks came across as deep and firm, while shadows showed nice smoothness and delineation. Everything here formed a fine presentation. I felt equally pleased with the dynamic DTS-HD MA 5.1 soundtrack of Riddick. From start to finish, the movie used all five channels as active partners. Music filled the whole spectrum in a satisfying way, and effects demonstrated good breadth. This made positive use of the soundscape. The components showed fine localization and blending; everything came from the right spot and the pieces fit together in a smooth way. When the track went for an action vibe, it cranked into high gear, but even when it stayed with ambience, it filled out the room in a vivid manner. Audio quality lived up to the standards of the soundfield. Music was bold and dynamic, and speech seemed concise and crisp. Effects demonstrated terrific range; highs were tight, and lows seemed deep and full. Bass response added a real kick and gave the movie great power. Everything worked well here. Among the set’s extras, the main attraction comes from two versions of the film. We find the theatrical edition (1:58:45) as well as an Unrated Director’s Cut (2:06:47). What does the additional eight minutes buy the viewer? I don’t know, as I only watched the longer cut. Nonetheless, I wanted to mention the presence of both. A mix of featurettes ensues. The Twohy Touch goes for six minutes, 22 seconds and offers notes from director David Twohy, executive producer Samantha Vincent and Mike Drake, director of photography David Eggby, and actors Vin Diesel, Katee Sackhoff, Bokeem Woodbine, Jordi Molla, Nolan Gerard Funk, and Raoul Trujillo. We learn about the decision to create another sequel as well as financing issues, going for an “R” rating, story/character areas and Twohy’s impact on the production. While brief and somewhat fluffy, “Touch” manages to reveal a smattering of insights, so it’s worth a look. With Riddickian Tech, we get a 10-minute, 14-second piece with Twohy, Funk, Sackhoff, Woodbine, production designer Joseph Nemec III, SFX technician Andy Antoine, visual effects supervisor Gunnar Hansen, and actors Keri Hilson and David Bautista. The show covers the design and execution of the film’s vehicles and sets. This includes a nice mix of practical and visual elements to offer a good glimpse of that side of the shoot. During the eight-minute, 50-second Vin’s Riddick, we find comments from Diesel, Twohy, Vincent, Drake, Woodbine, Funk, Sackhoff, Bautista, and actors Karl Urban and Matt Nable, We get some observations about the movie’s depiction of the Riddick character and Diesel’s work. This delivers a few decent thoughts, but it tends to be a puff piece to promote Diesel. Next comes Meet the Mercs. In this 10-minute, 44-second featurette, we hear from Twohy, Diesel, Sackhoff, Molla, Nable, Bautista, Funk, Hilson. Woodbine, costume designer Simonetta Mariano, and actor Conrad Pla. The piece examines aspects of the merc characters, including costume design and performances. This one mixes some expected happy talk with a smattering of insights; it’s not great, but it’s better than “Vin’s Riddick”. The World of Riddick fills 10 minutes, 50 seconds with info from Twohy, Nemec, Eggby, Vincent, Sackhoff, Hansen, creature effects lead artist/puppeteer Eric Fiedler, and special effects supervisor Ryal Cosgrove. “World” covers the design/execution of the movie’s alien planet as well as its creatures. This ends up as a fairly informative featurette. 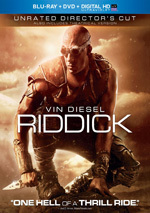 Finally, Riddick: Blindsided runs five minutes, 29 seconds and gives us an animated adventure in the film’s universe. I thought this would be an alternate tale, but instead, it essentially just animates a segment from the Director’s Cut; it takes a few liberties but still echoes the Necromonger segment. That makes it an odd addition to the set, though I guess it’s more useful if you only watched the theatrical version of the film. The disc opens with ads for Rush, Machete Kills, Grimm, The Best Man Holiday and Believe. Previews throws in ads for The Mummy, Van Helsing, Werewolf: The Beast Among Us, Pitch Black, Serenity, Battleship, Oblivion and the Jurassic Park trilogy. No trailer for Riddick shows up here. A second disc offers a DVD copy of Riddick. It includes “Vin’s Riddick”, “Meet the Mercs”, “Blindsided” and previews but lacks the Blu-ray’s other extras. It also provides only the theatrical version of the movie, so it lacks the Director’s Cut. While Riddick occasionally shows glimmers of life, it can’t sustain our attention. The movie tends to feel too scattered, too slow and too derivative to be more than sporadically entertaining. 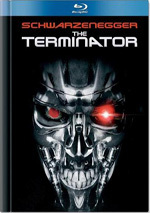 The Blu-ray boasts dynamic picture and audio along with a smattering of informative bonus features. Fans of the franchise may enjoy Riddick, but it does little to make me interested in the series.